ABBEYFEALE ON LINE! : ALL BLACKS TURN GREEN! There is a tavern in the town. And it was here that we assembled on Saturday evening to watch Ireland’s historic win over the mighty All Blacks. The atmosphere at the Aviva seemed electric as the teams ran out. Ireland’s Call was sung with great gusto and we all joined in. The All Blacks did their customary Hakka. It laid down a marker. “They’ll be knackered from all that dancing.” one wit proclaimed. The Irish team linked arms and looked on impassively. The visitors started strongly, tearing in to the Irish pack. But the thin green line stood firm, never conceding an inch and slowly began battling their way up-field. With ten minutes gone, New Zealand finally buckled and gave away a penalty in front of their own posts and Sexton lined up the shot. Meanwhile, up at the counter, two small farmers had their backs to the television and were loudly debating Brexit and its effect on the local economy. “There won’t be a sucky calf sold below in the mart next March.” one of them said. “We’ll be back to bailing búchaláns again.” his companion agreed. They quietened down and Sexton duly despatched the ball between the posts. This released a loud rendition of the Fields of Athenry from the Aviva faithful and again we all joined in. Even the two small farmers stood up and sang as loudly as the rest of us, with their glasses raised in celebration. “So, who is playing today anyway?” they asked when the singing had subsided, and were immediately issued with a yellow card and sent to the sin bin in the back room. Ireland dominated for most of the first half but still only managed a slender 9-6 lead at half time and we wondered if it was enough. We remembered that 2013 nightmare when we led by 5 points with minutes remaining, only to concede a converted try at the death. “Don’t mention the war.” we thought. 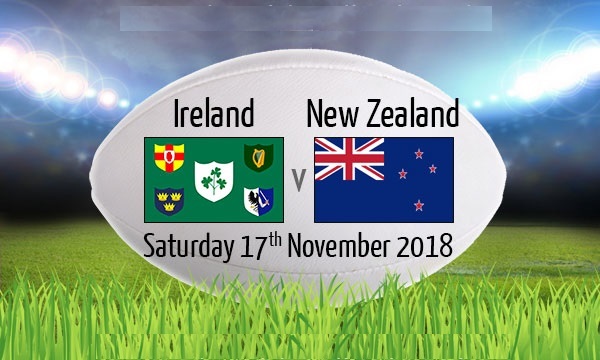 Into the second half and Ireland continued to retain possession and territorial advantage, so much so that, after 48 minutes, the All Blacks suffer the humiliation of having their entire front row replaced! New Zealand threw the proverbial kitchen sink at Ireland in the closing quarter but to no avail. The Irish defence was awesome and even the television on the wall seemed to shudder as another crunching green-shirted tackle went in. And then it was over and Ireland had done it! The first Irish team to beat the All Blacks at home in 113 years of trying, and 40 years after that famous Munster victory in 1978. The whole place erupted as the ghosts of the past seemed suddenly to mingle with the stars of the present. It was a moment to remember. The two small farmers emerged from the sin bin, attracted by all the singing and cheering. “Who won?” they wanted to know. They were immediately yellow-carded again and despatched once more from the field of play as the victory celebrations gathered momentum. What a day, what a year, what a team!